082 Could Podcasting Make You a Better Writer? 081 When Do You Abandon the Editing Process? 075 Listener Challenge: Could You Read 100 Books in a Year? 062 Do Millennials (Really) Hate Long Copy? 049 My Second Most Favorite Copywriting Formula in the World! 047 My Favorite Copywriting Formula … Ever! Indeed, it can. It can also make you a more visible writer. But that depends on how you go about it. On this episode of Rough Draft, I interview Jerod Morris and Jon Nastor. Jerod is one of the VPs of Rainmaker.FM, my co-host on The Lede, and a co-host on another Rainmaker.FM show called The Showrunner. Jon Nastor is a serial entrepreneur, host of Hack the Entreprenuer (also on Rainmaker.FM podcasting network), and the other host for The Showrunner. Could Podcasting Make You a Better Writer? Voiceover: This is Rainmaker.FM, the digital marketing podcast network. It’s built on the Rainmaker Platform, which empowers you to build your own digital marketing and sales platform. Start your free 14-day trial at RainmakerPlatform.com. Demian Farnworth: Hey, this is Rough Draft, your daily dose of essential web writing advice. I am Demian Farnworth, your host, your muse, a digital recluse, and the Chief Content Writer for Copyblogger Media. Thank you for taking the next few minutes of your life with me. All right. Tell us who you are or what you do and why you do it. We have two people here, Jerod Morris and Jon ‘the Nasty’ Nastor. Jerod Morris: I’m Jon Nastor. My friends call me Jonny. I host Hack the Entrepreneur. Jonny Nastor: I’m Jerod. I do some other stuff for Copyblogger. Demian Farnworth: Why do you guys do it, though? You didn’t answer that part of the question. Jerod Morris: Why do we do … I’m Jerod, by the way. Sorry we’re being silly, Demian. I apologize. Jonny Nastor: I’m sorry, Demian. Demian Farnworth: Behave yourselves. Why do you do what you do? You guys host the show — among other things that you do — The Showrunner. Demian Farnworth: You host the podcast, but it’s also an online training course for podcasting. But you are always very particular when I say that, that it’s more than podcasting. We’ll get to that in a minute. Tell me, why do you guys do what you do, this particularly? Jerod Morris: I will be interested to hear Jonny’s answer on this. For me, it’s quite simple. When the opportunity came up to host the show on Rainmaker.FM, I knew I wanted it to be about the topic of podcasting, because I’ve hosted many shows in the past. I’ve seen such incredible returns on them, both personally and professionally, and learned a lot. I just want to share that with other people. I know how much more experienced people help me as I was coming up and didn’t know anything, and I just want to repay that and help people who are new get confidence behind the mic, get confidence that they have the information they need and help get new shows off the ground and keep current shows going through the tough points that always come. Demian Farnworth: What about you, Jonny? Jonny Nastor: I think mine is similar. Almost one year ago — one year ago yesterday, actually — I started Hack the Entrepreneur. I started a podcast literally because I had some time last summer, and I had been online for a couple of years full time, writing and creating products, but I was behind the scenes. I wanted to come out of obscurity, as they would say, and become known for what I did. I decided to put my head down and start a podcast, talking to other business owners and entrepreneurs, and hopefully create a show that resonated with an audience. I don’t really like the personal brand sort of thing, but I wanted to just become known for what I did, not just behind the scenes, always. Then, I wanted to also help other people do what I did in a relatively short period of time with a lot of work. That was kind of the thing. I just wanted to try and help other people do what I was able to do. Demian Farnworth: Tell us what The Showrunner podcast is and then what The Showrunner online training course is. I know for me, when I viewed myself as a podcaster, I had a limited view of what I was doing. I was creating these episodes, but there wasn’t anything bigger. There wasn’t a community. There wasn’t a business goal there. As my personal projects with podcasts started to expand, I started to see my role as something bigger. Again, I wanted to transfer that mindset to other people because I saw the successes that I was having expand when I started to think that way. The podcast is, basically, our introduction for people to these ideas. It’s not that we don’t go into depth on them — we do in every episode. But then the course is that next step, where we’re really able to engage and have this community of like-minded people who are not just listening out of curiosity, but are there because they either have a show they want to take to the next level, or they’re starting and they want a road map and then the help and enthusiasm and support along the way to keep it going and make it remarkable. Jerod Morris: That was something that we came up with in a conversation with Brian and Robert. Really, it’s taken that idea from television, because that’s where the term had first been used. I always thought of showrunners as like Vince Gilligan, or Matt Weiner of Mad Men. That’s when I first heard of the term. I thought, “That’s such a great term for the person who is between the producer and the talent.” Now in this case, we’re both the showrunners and the talent of the show. When you’re running a show, a lot of times, you are. But it’s taking the resources that you have from the producer and then creating this remarkable experience with it. We thought that term just really, really fit what we were trying to get people to see themselves as. Demian Farnworth: If The Showrunner training course is more than just about becoming a podcaster, what is it? What is the ‘more’ part? What are you guys are trying to educate people on? Jerod Morris: I feel like I’m talking too much. Jonny Nastor: Yeah, like I don’t know if it’s necessarily ‘more.’ It’s a different view of going into a podcast. We don’t just go into, “Here’s how to hit ‘record,’ and here’s …” You know what I mean? We start way before that, like ‘What’s defining an audience?’ and figuring out what it is you can provide to that audience, which is where Jerod came up with the four elements of what a show needs to be successful and useful. We really dive deep into why you are podcasting, who you are podcasting for, and then the transformation you want your audience, once you define them, to have. That’s where you become useful within this and therefore profitable, either extrinsically or intrinsically, which we also get into. Then, we go into, obviously, the how to: how to hit record, how to do an interview, how to reach out to people. It’s more than just that. I think lots of people think of, “I need to learn how to podcast. I need to figure out how to learn GarageBand.” To us, that’s a very, very important thing. You have to have a good quality sound, but it’s way bigger. There’s just way too many podcasts coming out now that are just focusing on that element. I think that’s what we mean by going sort of making it a broader showrunning experience. Even before I met Jerod and started doing this, when I did it with my own show, I think I was a showrunner in that way, because I came from running a business. I knew that when I was creating a show, I wasn’t going to do everything myself. I was going to become the producer of the show in the middle of it, and I was going to bring in different people to help me do things and hire contractors to do stuff just to make it a better experience for my audience. It wasn’t going to just be me doing all of it. We really try and promote that. Not that you have to hire an editor, and you have to hire ‘this.’ You have to think in that way so that when your show evolves and starts to become profitable, then you can bring people in, but still think like the producer of it, think like it’s a bigger thing than just a podcast, of which there’s thousands coming out every day. Demian Farnworth: Right. Because after you hit ‘publish,’ and it’s out there on iTunes, your job is not really done, right? Because you have to manage the audience, too. Jonny Nastor: That should be, I think, the point of the show, to create an audience and an audience experience, and then to do something with that audience and audience experience. Demian Farnworth: Okay. I know Jerod wanted to say something about audio content. 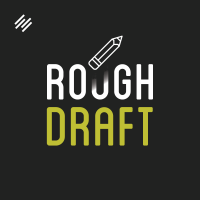 Because Rough Draft is a show loaded with writers, and people who listen to Rough Draft are typically writers, doing a podcast — doing any kind of audio content — may or may not be on their radar. Jerod, I know you wanted to talk about the writing process, though, in that context. Jerod Morris: Yeah. I think it’s interesting, because you’re right. This is a show that you do for writers. I think one of the exciting parts about doing The Showrunner, the podcast and the course, is seeing people who never saw themselves before as a producer of audio content being able to do it. I think what’s great about everybody listening to the show, both in terms of their experience and what they’re learning from you, Demian, is you have all of the fundamentals to start a show, because the most important parts are not the mic that you get and the audio stuff. You can get the minimum level of audio quality without too much trouble. People get so intimidated by that sometimes that it keeps them from even starting. What’s most important, and Jonny alluded to this earlier, is understanding your audience, choosing the right topic, making sure that you have really fleshed out these ideas so that you can speak about them — whether you’re using a script, whether you’re talking of the cuff, whether you’re doing an interview – and being able to research properly so that you can speak clearly and deliver a cogent, succinct message to an audience. What’s great is that that’s what you’re teaching people with Rough Draft. All of those skills and all of those experiences that you go through as a writer basically prepare you to be a showrunner, to be someone who can create audio content that is compelling for an audience. I think for any people who are listening to Rough Draft and think of themselves as just writers and haven’t really considered themselves a podcaster — and I think maybe you experienced some of this, too, Demian — those people are closer than they think. You are a perfect example of it as someone who has spent so much of his career writing, but now you’ve started the show. You’re creating four episodes a week, which is insane, by the way. It’s awesome that you’re doing it, and you’re doing it so well. Part of it is because they’re these ideas that you’ve written about before, and you understand them, and it helps you to articulate them in a clear way. That’s such an important part of creating a really good, remarkable audio experience. Demian Farnworth: Let me ask you guys: I know that one of the biggest challenges I have doing the podcast is thinking on my feet. We do The Lede together, Jerod. That’s a little more off-the-cuff and back-and-forth, but I have a tough time thinking through what I’m going to say. A lot of my shows will be scripted, so I have something if I get lost. It’s like the deer in the headlights. What about you guys? Do you guys feel you’re comfortable thinking on your feet? Because that’s one of the reasons why I like doing the podcasts is that it challenges me to improve that skill set. Jon, why don’t you answer that? Jonny Nastor: I was terrible at it, and I’m still not very good at it. As I said, I started Hack the Entrepreneur a year ago, and I’m now 105 episodes into it. I’ve gotten better, but I really had to cheat. And I still do, meaning that I’ve created a PDF that I’ve reworked 25 times now of places I can fill in and write as I’m doing my interviews. I have an interview flow sheet that I keep on my desktop as I’m doing an interview, because I always freaked out. I still sometimes am. Like if I give somebody a question, I was always worried that they were going to stop talking right now. They’d give an answer, and they’d just stop, and then I wouldn’t know where to go next. I had to cheat and make myself confident by being like, “Okay, here’s the next question, Jon.” I always know where the next question was. Now, I don’t need to use it as much, because I’m 105 episodes in. But I really, really had to go off of that. I was terrible thinking on my feet, and I’ve gotten so much better in the last year. That is also something that I’ve really wanted to work on myself. It’s such a great way to do it, right? It’s uncomfortable, but it’s not as uncomfortable as getting on stage and trying to sort out thinking on your feet in front of a live audience, right? Jonny Nastor: Exactly. You still get to do it in your own closet or bedroom or office or wherever you happen to podcast from, right? Although it’s difficult, it’s not as difficult. It’s a great stepping stone. It really helps me just solidify ideas and work out. If I can verbally talk them through enough times with enough people, I find that I really start to understand my ideas themselves, and that’s helped me in that way. Jerod Morris: I had a really hard time with this early on because when I first started podcasting, almost everything I did was very scripted. Like you were talking about with interviews, Jon, when I would do an interview, I would try and have ‘question,’ ‘anticipated follow-up question’ — I didn’t want any moment where I didn’t know exactly what I was going to say next. I think what’s really helped me move past that and get to the point where I feel very comfortable in those situations is actually hosting a couple of live shows. Hosting some shows, we do them as a Google Hangout and post them later as a podcast. You start the broadcast. The green light goes on. You’ve promoted it before, so people are watching you, and it’s go time. One of the shows I do is a post-game show, so there’s literally no time to prepare. You watch the game, and you’ve got your memories, and then you’ve got to sit there and talk for an hour and lead a conversation. That pressure of seeing the light go on and then having to perform, in a sense, has really helped me get more comfortable. That’s a personal project. It’s helped me get more comfortable in so many different professional venues as well and has been such a valuable experience, but it took time. Jerod Morris: I haven’t really talked to anybody that says that they just felt comfortable behind the microphone right away. Almost every podcaster or showrunner that you talk to has this experience where it really took them a while. Their first of couple of shows may have even flopped because of it. They may have given up because they were frustrated with it. The ones who kept at it and showed up again and again for that one show or showed up again to start another one, those are the ones that tend to be successful. Demian Farnworth: We’ve talked about this before. It’s like when you just get started, nobody is really paying attention to you. Demian Farnworth: You don’t really have an audience. Your first five, six shows are probably — outside of your immediate family and a few good friends — it’s not going to have a large audience. Those people always can be very forgiving for them. Outside of the two styles — there’s monologue, and there’s interview. Are there any other podcast styles that people can think about doing? Or is that it? Jerod Morris: Sure. I think the style that you and I have for The Lede, Demian — and our style has changed. When we first started running The Lede together, we had everything very scripted. If you remember those Evernote scripts we had, it was almost word for word. I think the information there was good, but I think the episodes have gotten better since we’ve gone a little bit more topical, and then we are conversational about it. It’s a little bit more natural. That’s certainly another option. That’s the one that Jon and I use for The Showrunner as well. Then again, you’ve got other, more creative options, where you can do a Google Hangout and turn that into a podcast. That’s a different format. I think the basic monologue, interview, or discussion style with the co-host, those are the three most prominent, and really great places to start for someone just getting into it. You have that anchor to begin with, with your format. Don’t be afraid to change or pivot a little bit or adjust it as you go to do something that’s a) more comfortable, or b) and this is important, something you can actually keep up. If someone is struggling with an interview format because the scheduling part is hard, and you’re like, “Man, this will be so much better as a monologue because I can just do it myself,” then maybe try that. Do it. I think there’s several considerations to take into account when you’re deciding the format. Demian Farnworth: All right. Jon, I want to ask you a quick question, because I know you’ve dealt with this. We’ve mentioned the fact that the field is not getting any smaller, and every day, more and more podcasts are coming along. You entered what I thought was a very difficult and competitive field, being the business entrepreneur interview-style podcast. I found your approach very intriguing. Why don’t you give us a short, brief history of what you did before you launched Hack the Entrepreneur? Jonny Nastor: I recorded just over 20 episodes and fully produced them and sent them to every person I that I knew closely online, that I knew who was a fan of listening to a podcast about business and had listened to them before, and I would send them ideas. The thing with mine, the ‘hack’ at the end was something that I wanted before I even started. I knew I needed something to keep people’s attention through it. I had no idea what that was, and I just talked to people and talked to people, came up with the ideas. Then that evolved over my first 10 episodes, which I’ve still left them in there. My idea of the hack even moved throughout the episode, where it was, until I would finally get feedback. Demian Farnworth: The ‘hack’ is … ? Jonny Nastor: The hack is me pulling out a part of the conversation — say, 10 seconds or 30 seconds of the conversation — that to me is the most meaningful part. Then I do a brief one-minute to five-minute essay after it. I’m tying it home and tying it to what the idea of Hack the Entrepreneur is. I play all of that at the very end after the interview. I get people emailing me all the time and disagree with the hack I picked out or telling me how much they agree with the hack. Jonny Nastor: Like these husbands and wives, they listen to it together, and then they stop it before we get to the hack part, and they’d argue about what the hack is going to be. Demian Farnworth: That’s good. You also, before you even recorded, didn’t you have a pretty extensive research base? Jonny Nastor: Before I recorded? Jonny Nastor: Okay. Before I started, yes. In March, I was at a conference, and that’s where this idea of starting a podcast came. I actually didn’t hit ‘record’ until mid-July. The reason I went into entrepreneur interviews is because it’s a massive market, which is the reason why most people don’t go to those. But I was like, “I’m going to try and do it right and fit in in a unique way that I find my complete, own area in this massive market, because it’s huge. It could take off to something fun.” I have the ability to do it because it’s podcasting. It’s just this massive leverage point that, if you can get ahold of part of a massive market, it could be really interesting and fun. It turned out great. I did. I consumed everything I could within the market space that I wanted. Plus, then, I went out to other interview podcasts in different markets to see what they were doing and see if I could steal stuff from there that was working and bring it in. Then I just found a unique way. I found out that the biggest interview shows in my market were going very tactical-based, very, ‘how to do this,’ ‘how to do this.’ I went to the other side of it. I just wanted to talk to the entrepreneur and about the entrepreneur: no tactics, no anything. I literally want to know what you do wrong, what you think, how you do it. People have now told me that I’m the psychiatrist to entrepreneurs. I try and get them to open up and confess that they’re human beings struggling through this. It’s hit a market, in a way. It’s hit an audience. It stood out. Jerod Morris: I love Jonny’s story. I think it’s part of the reason why The Showrunner works. Because we’re very different. As you’re describing that, it’s very meticulous, very planned out. A lot of my shows are ideas that I had at 8:00 in the morning and then I executed on them at 10:00. You know what I mean? I just had an idea to start a podcast for Primility, and I just did it on Tuesday morning after having the idea Monday night. There are different ways to do it, and there are actually advantages to both ways, I think. I think one thing that we try and do on The Showrunner is give some different perspectives. We don’t always agree on things. Just like you, Demian. You know on The Lede, there’s different ways to do this stuff. I think it’s really important that you don’t think there’s only one way to do it. You need to do the way that fits with you. If you expose yourself, as Jonny did, to different shows and different blogs, whatever it is, you’ll find people who are like you and did it like you. You’ll see that there’s a lot of different ways that this can work. Demian Farnworth: Right. I know I’ve got freelancers listening in, and I know I have business people listening, too, but anybody interested, listen to Hack the Entrepreneur, if you haven’t yet. Of course, listen to The Showrunner. Also, you guys have a promotion coming up for the training course, don’t you? Jerod Morris: We do. The course is not open all the time. We open it at certain times for a couple of weeks, bring in a batch of new students, then close everything down and work really hard together on getting everybody’s shows, wherever they are, to that next step. The pilot launch of the course is done. We’ve got hundreds of people in there working hard, a great thriving community already built. August 3rd through the 14th, we’re going to be reopening it for a couple of weeks. Anybody who’s interested will have a chance to get in. Of course, it’s a Copyblogger product, so you can test it out for 30 days. Demian Farnworth: It’s open between August 3rd to the 14th? Jerod Morris: Yeah. The 3rd to the 14th. Then, we’ll be closing it down again, and probably not reopening it until … who knows when the date will be? It won’t be for a while. What we did is, if you go to Showrunner.FM right now, you’ll see the big call-to-action box to join the email list. Not only will you get updates on when we release new episodes, and you’ll get the first notification when the course is open, but we also wrote a content series called The Four Essential Elements of a Remarkable Podcast. When you sign up for the email list, you’ll get that dripped out over the course of a week. It will go over, basically, the four big pillars of creating a remarkable podcast: authenticity, usefulness, sustainability, and profitability. What’s great about those is they’re not just specific to showrunning and podcasting. They’re really the four essential elements of a remarkable piece of content. Even for people who are more focused on writing but not necessarily podcasting, that’s okay. We’ve structured this in a way that it’s really useful for anyone who’s creating content. Demian Farnworth: Great. At the least, subscribe to the email newsletter and listen to their shows. They’re both very entertaining guys. I like you both a lot. I don’t say that about everybody. Jerod Morris: I like you, Demian. We should host a show together. Demian Farnworth: All right, gang. I appreciate you guys taking the time to come on and informing us about your show and podcasting and how you guys got there and all the great tips you guys shared. Jerod Morris: Thank you. Thank you for letting us talk to your audience. Demian Farnworth: You bet. Thanks, Jon. Thanks, Jerod. Take care, guys.